We got an early start and had breakfast at the Huddlehouse before going on to Patriots Point Naval & Maritime Museum. 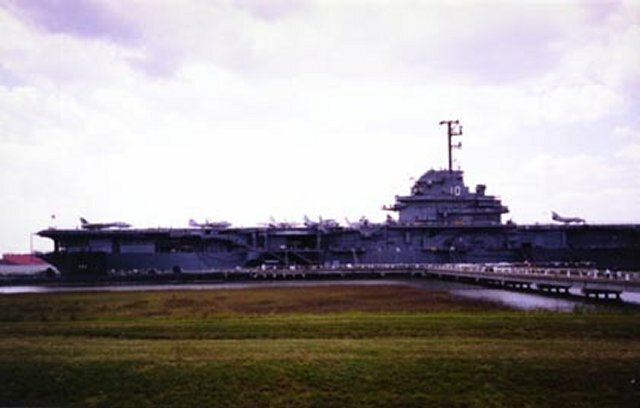 Located on Charleston Harbor, Patriots Point is home to 4 ships and 25 aircraft. We explored them all. The USS Yorktown (CV10), the famous "Fighting Lady" of World War II, is the flagship of the Patriots Point fleet. She was commissioned April 15, 1943. 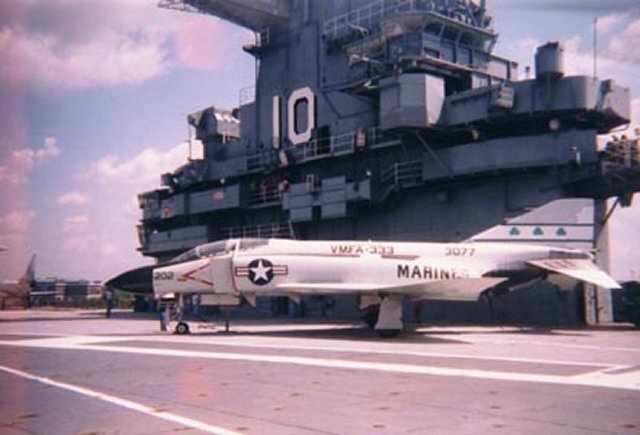 Her number, CV10, indicates she was the 10th aircraft carrier to serve in the U.S. Navy. She was the recovery ship for the Apollo 8 space mission in December, 1968 and was decommissioned in 1970. 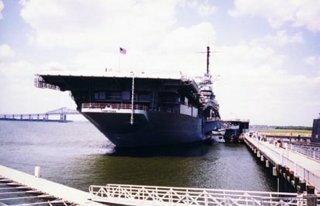 The ship is 888 feet long, displaced 27,100 tons during WWII, and carried a crew of 380 officers, 3088 enlisted men, and 90 planes. There are several self-guided walking tours that seem to cover almost every square inch of the Yorktown. 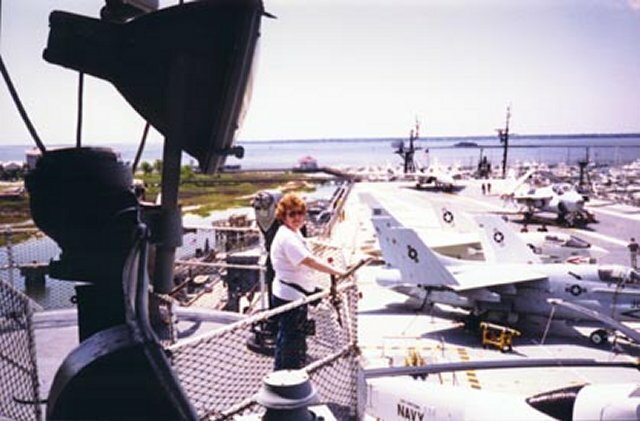 The flight deck of the Yorktown with the "island" in the background. The designation on the plane of "VMFA-333" refers to a Marine Corps squadron nicknamed the "Shamrocks" based at MCAS Beaufort, South Carolina. Diana checks out the view from the flight deck. 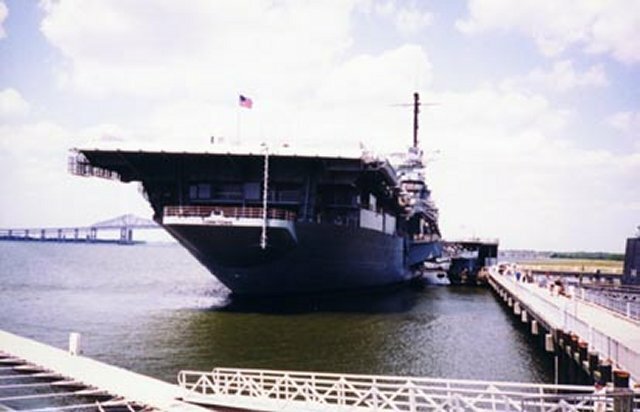 The Yorktown as seen from the stern. Just to the right is the conning tower of the submarine Clamagore. The USS Clamagore (SS-343) was commissioned June 28, 1945. She operated in the Atlantic and Mediterranean and patrolled Cuban waters during 1962. 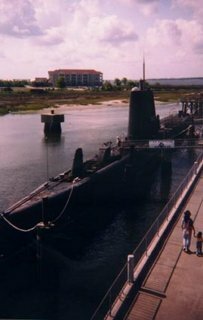 One of the Navy's last diesel-powered subs, she was decommissioned in 1975. Click on the rotating sub to dive. 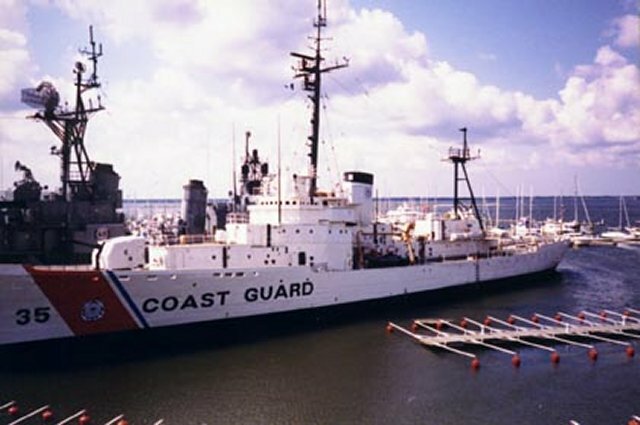 The Ingham (WHEC-35) was one of the most decorated vessels in the U.S. service with 18 ribbons during a career of over 50 years. She was credited with sinking a German U-Boat during World War II. The Ingham was commissioned in 1936 and decommissioned in 1988. The destroyer USS Laffey (DD-724) can be seen behind the Ingham in the above photo. The Laffey participated in the D-Day landings June 6, 1944. She was transferred to the Pacific and suffered severe damage during Japanese "kamakazi" attacks April 16, 1945. During this attack, she earned the nickname "the ship that would not die". 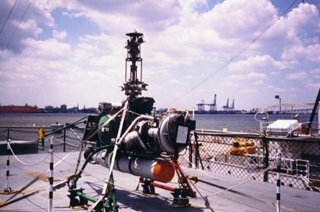 This is a QH-50A DASH (missing its rotors) on the deck of the Laffey. This aircraft flew from destroyers like the Laffey during the 1960's. David has a friend whose claim to fame was being shot down five times over Vietnam flying QH-50's. You may ask how he could have survived. Look carefully. There's no place for a pilot on the QH-50. It's flown by remote-control. DASH stands for Drone Anti-Submarine Helicopter. Last revised: November 14, 2000.